Peter Francis Williams came to Carlton in 1890* from Ballarat, and was something of a sensation when he kicked 20 goals in his debut year. Playing in a variety of positions, he was soon a star of the team, and in 1894, he was made captain of the club. Probably because of that affair, Williams lost the captaincy after only one season, but stayed on the roster of players. He was 30 years old when Carlton joined the breakaway VFL in 1897, and it was soon obvious that his experience and on-field leadership were sorely needed. He was recalled to the team to make his VFL debut in round 2 of the new league, when Carlton took on South Melbourne at the Lake Oval. Playing at half-back, Williams was a stumbling block for the Bloods all afternoon, although the home side eventually won a cliff-hanger by 4 points. He went on to play 11 matches that year, and another 22 before he retired in 1899. Carlton had finished second-last on the ladder in all of those seasons, and the future looked bleak. 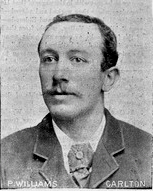 Some 18 months later however, at the age of 34, Williams made a short-lived comeback for the Blues against St Kilda in round 5, 1901. On a miserably cold and wet afternoon at Princes Park, Carlton kicked 5.10 (40) to beat the Saints 2.8 (20). Williams kicked his one and only VFL career goal from a half-forward flank, and retired for good on a winning note.
.* Origins of Australian Football Vol 5 has Williams playing 94 VFA games between 1888-1895. Other details indicate that he played 11 games in 1889 which may not have been counted, this would take his tally of senior games to 105 plus the 34 in the VFL. 1890. C.F.C. Annual Report, Williams scored 20 goals during the season. 1891. C.F.C. Annual Report, Williams scored 7 goals during the season. 1892. Among Carlton's best players. 1893. Loss through injury during the season. 1893. C.F.C. Annual Report, Williams scored 3 goals during the season. 1894. Peter Williams newly appointed Captain, even let the club down by not turning up to play against Collingwood at Victoria park. 1894. Williams played well at times. 1895. The V.F.A. Permit Committee refused P. Williams a transfer from Carlton to South Melbourne. 1896 The North Melbourne Gazette May 01, mentions that Peter Williams may be playing for North this season. 1924. P. Williams played in an old players match at the M.C.G. on September 26. The Richmond Guardian January 20 1917 (p7) mentions that Carlton champion Peter Williams was, in his younger days, captain of Parkville Juniors. Contributors to this page: blueycarlton , pblue , Jarusa , molsey , PatsFitztrick , tmd1 , WillowBlue , p(12)terg and admin . Page last modified on Thursday 14 of December, 2017 12:16:27 AEDT by blueycarlton.